Charles River Development, a State Street Company, provides an end-to-end solution to automate front and middle office investment management functions for buy-side firms in the institutional asset and fund management, private wealth, alternative investments, insurance, banking and pension markets, representing over $25 trillion of assets under management globally and 25,000 users in over 40 countries. Delivered as a hosted service, the solution help improve data quality and investment professional productivity, manages risk, and helps lower technology costs. Charles River maintains a local presence in all major financial centers worldwide. In Latin America, Charles River has sales and service partners in São Paulo, Mexico City, and Santiago. As a global solution provider, Charles River serves 350 buy-side firms including over a dozen firms across Brazil, Chile, Mexico, and Panama. 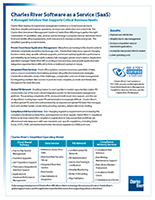 Available with Portuguese and Spanish language capability, Charles River IMS supports region-specific security types and associated workflows and helps clients comply with regulations.